American manned rescue spacecraft. Study 1963. MOOSE was perhaps the most celebrated bail-out from orbit system of the early 1960's. 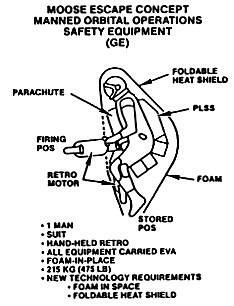 The suited astronaut would strap the MOOSE to his back, and jump out of the spacecraft or station into free space. 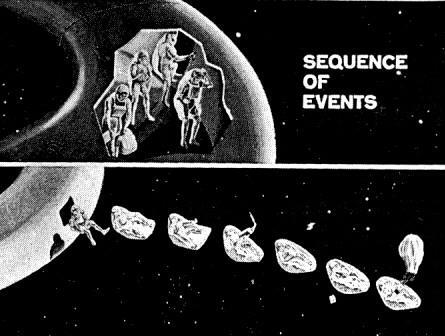 AKA: Man Out Of Space, Easiest. Status: Study 1963. Gross mass: 215 kg (473 lb). Height: 0.87 m (2.85 ft). Span: 1.83 m (6.00 ft). Pulling a ripcord would fill an inflatable heat shield with polyurethane. The astronaut would use a small hand-held gas to orient himself for retro-fire, and then fire a solid rocket motor strapped to his chest to return to earth. The MOOSE consisted of a chest-mounted parachute, a flexible, folded 1.8 m diameter elastomeric heat shield, and a canister of polyurethane foam. Pulling the deployment cord would fill the shield into shape and encase the back of the astronaut in perfectly form-fitting polyurethane. The astronaut would use a small hand-held gas get device to orient himself for retro-fire, and then fire a solid rocket motor mounted in the device. After aligning himself for re-entry and putting the MOOSE into a slow roll, he would throw the gas gun away. After a ballistic re-entry, the astronaut would pull the ripcord of the chest-parachute, which would pull him away from the heat shield for a parachute landing. There was also the choice of staying with the shield for a landing on land or water./ The buoyant polyurethane crushable structure would absorb the landing shock, and encased in the foam was a survival kit, SOFAR bomb, radar chaff, altitude flare, and food and water. General Electric conducted a number of technology proving tests. A heat shield was manufactured and folded. Test subjects were foamed into place with various formulae of polyurethane (it was found necessary to add a little castor oil to the formula to allow the pilot to extract himself from the foam). In a final test the test pilot jumped six meters from a bridge in Massachusetts and successfully survived water impact and floated downstream (a competitor claimed there was a little bit of a difference between 6 m and 500 km). The foam tests showed the heat (exceeding 100 degrees C at the core) that the foam generated during the exothermic deployment reaction was not transferred to the subject and was not uncomfortable. Tests of the ablative materials were conducted in the General Electric supersonic air arc tunnel and verified the heat of ablation of the flexible shield material. Studies of heat transfer during re-entry showed it was well within the limits that could be handled by a standard space suit backpack. The General Electric team felt they had a real winner - a lightweight system (215 kg, including the astronaut) that avoided the deployment problems of inflatables. But with the cancellation of the X-20 Dynasoar and military space stations, such concepts were shelved and faded into obscurity. Family: Space station orbit. Country: USA. Agency: GE.